Masonry Products with a Rock Solid Reputation Since 1945! Shaffer Block & Concrete Products, Inc. is a family owned and operated company that has been manufacturing concrete block for over seventy years. 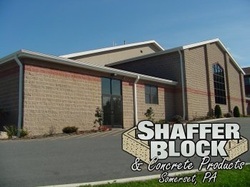 Founded in 1945 by William S. Shaffer, the plant and retail store are located at 951 South Edgewood Avenue in Somerset, PA.
Shaffer Block manufactures a complete line of standard gray concrete block. We are able to supply residential projects as well as commercial and industrial projects of any size. Our line of hardscape products include retaining wall block and concrete paver brick from LibertyStone and Hanover Architectural Products. Shaffer Block is a dealer for six different brands of manufactured and real thin stone veneer. We have a large display featuring all of the brands in our store. In our tool department, you will find a complete line of masonry and cement finishing tools from manufacturers like Bon Tool, Marshalltown, Rose and Crick Tool. We also sell the full line of Hitzer Coal Stoves, Fireplace Inserts and Furnaces and Blaschak Hard Coal. All of the employees and management at Shaffer Block would like to thank you in advance for considering us to supply your masonry needs. Our goal is to provide you our customer quality products and service that is second to none every day of the year. We look forward to a long lasting relationship with you and hope to be favored with your business.